Over 9 years ago, I created a blog called Comic Box Commentary with the plan to cover all the comics that I was enjoying at the time. Then 9 years ago tomorrow I realized the canvas was too big and decided to be a bit more focused. 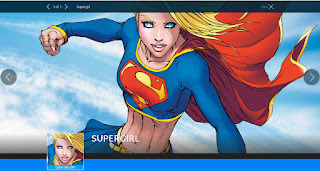 Hence the vaguely titled Comic Box Commentary became Supergirl Comic Box Commentary. And that is the origin of my terrible blog name. I suppose I should have simply started anew. But I didn't think about it that much. How long would I do this? How often would I do this? Would I find it creatively rewarding (the reason I started it to begin with)? Turns out, yes it is creatively rewarding. I would be posting often and for a long time. How people found this place I'll never know. And so today I celebrate my 9th anniversary the usual way I do - by thanking everyone who stops by, reads my comic reviews, and deals with my ramblings. I love the community of Supergirl fans who come here and the dialogue that occurs. So let me give you a round of applause. I deeply appreciate you all for visiting. In particular, I congratulate those of you who read my long reviews! I have become friends with so many people because of this site as well. From podcasts to con meet-ups to sending each other comic stuff, it is such a fantastic group that I am honored to be included in! Lastly, it is hard to believe how far the character has come during those 9 years! I started this site because I didn't like how Supergirl was being portrayed in the comics at the time. I also wanted to highlight her oft-forgotten history. Now she is everywhere! So I'm raising the virtual glass of champagne to everyone! Thanks for being part of this place! I shouldn't be surprised by crazy responses to things these days but a portion of Supergirl critics and fans of the show had a bit of a meltdown. Would Zod be a Superman villain fighting Supergirl? Would there be room for another villain in a show which already has Cadmus and Queen Rhea?? And why take time away from a Supergirl show with someone clearly more associated with Kal? But I think there is a simple answer. I think his role is going to be little more than a cameo. 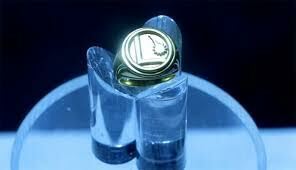 That is because from the beginning I have said that there is going to more to come from this Legion ring so prominently displayed in the show. And that makes me think my prediction about Mon-El is going to come true. Supergirl episode 218, title 'Ace Reporter', aired this week and was a very Kara-centric episode, something which has been a bit lacking recently. We see a lot of Kara Danvers and a little bit of Supergirl. And for me, someone who loves complex characters with some depth, this was phenomenal. Yes, we have a mega-arc going on with Cadmus and Daxam. And yes, those are important. But I watch the show for Supergirl.So I was thrilled about this. The title Ace Reporter is an appropriate one since the search for truth is a key part of the plot. And one of the things that I have noticed this season is that Supergirl is feeling good about herself lately. She has a swagger that makes me worry that she is heading for a fall. This story also played on that a bit. But, in some ways, this was just as much a Lena episode as it was a Kara one. Lena has been sort of on the periphery of the show. We learned a lot about her early on in the season and during the 'Luthors' episode. But in many ways she is something of an enigma. We hear that she and Kara are best friends but we haven't really seen how that relationship came about. We see how Lena worries about whether she will descend into the megalomania her family is so well known for. But she is a mystery. Every episode she is in ends with me thinking 'is she a bad guy or a good guy?' We see much more of that up front here. There are some ominous overtones to the arc. And I can't help that there is some foreshadowing to an eventual confrontation between Supergirl and Lena. I have to add that Katie McGrath is stunningly beautiful in this episode. There is a fine subplot with Winn, James, and Lyra.Mon-El is funny and helpful here. We get a lot of Snapper here. There is a great cliffhanger. But the main focus is Kara and Lena. And that made for a great episode. Super Sons #3 came out last week and was another chapter in a fast-paced, fun title. Things really seem to be propelled forward in this story. Not much decompression here. And that frenetic, almost 'short attention span' feel to the stories seems appropriate for the protagonists. Everything happens fast in that time of life. But this isn't just an action book. Most of the fun here is seeing Jon and Damien interacting. At times I have said that the 'always at odds' relationship that DC has forced on Superman and Batman is adolescent and sophomoric. This plays that up. These characters are adolescents! So seeing them be friends and that at each other's throats makes sense. It plays up how silly the Superman/Batman stuff is these days. One of the problems with that contrast between the characters is that a writer could have them become more one-dimensional. So writer Peter Tomasi has to keep these interactions feeling fresh. I don't want Jon to always say 'this is crazy I'm calling Dad.' And I don't want Damien to always say 'no, I'm the best. I can handle this.' Part of the fun will be seeing how each influences the other. 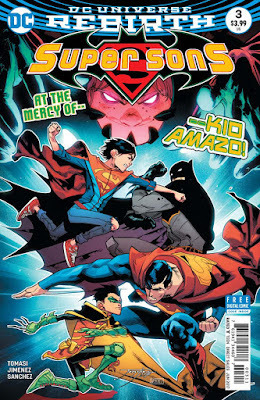 The art by Jorge Jimenez is the perfect match for this title. Everything is a little warped and stylized. There is this slight craziness to it which works with the pace of these stories. I love it. Now this arc involves Kid Amazo and I have to say I feel a little lost in what the villain's powers are. But I am just along for the ride here. It's like a roller coaster. Just grab on and try to take it all in. How do you remake a book that was just made? How do you reboot something which was just booted? But that is what is going on in the Superwoman book. Phil Jimenez idea of Lana being infused with energy from the dead New 52 Superman couldn't exist anymore in the post-Superman Reborn world. 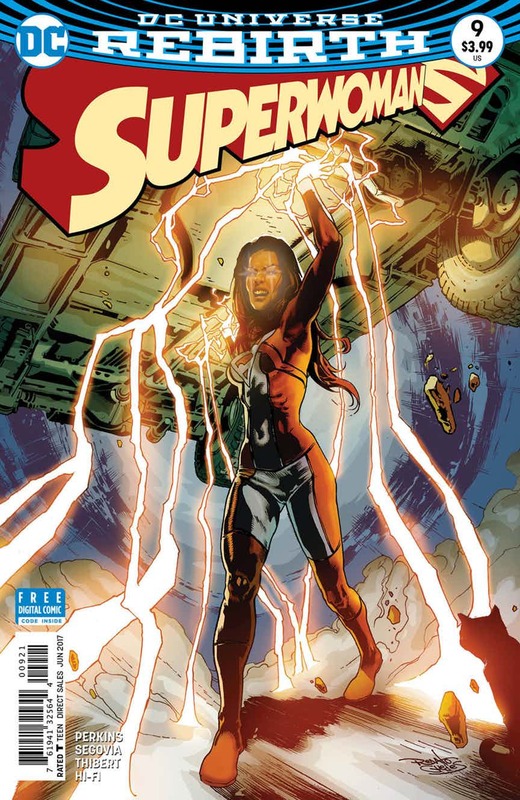 And frankly, the first arc of Superwoman ended in such a jumbled, over wordy, preachy, and confusing manner that maybe erasing that and semi-starting fresh makes sense. I know I am trashing the prior arc but the truth is I enjoyed the opening chapters. It just all seemed to lose its way. Superwoman #9 has the difficult task of somehow continuing the title, building on some of what has come before, all while trying to explain away the inconsistency of the recent past. Enter writer K. Perkins (of Supergirl Crucible fame) and artists Stephen Segovia and Art Thibert. Can they pull it off? At least for this first issue, for me, the answer is yes. Instead of immediately trying to explain how Lana had powers, what adventures she has had as Superwoman, and what truly happened, Perkins instead concentrates on who Lana is as a person. The powers and the missions are important, but the character of Lana is the foundation of this book. We need to learn that first. In Jimenez book, Lana was an extremely complicated character. She was a begrudging hero. She had anxiety issues. She was struggling with the pressure of all aspects of her life. And she was hiding all of this fear from those who loved her. I didn't always like Lana in the book. She seemed to have a hair trigger to lash out at those supporting her. She seemed ashamed of her problems. But always, she eventually tried to rise above. Perkins seems to embrace all of that complexity. Complicated and conflicted characters are always fascinating to read. Indeed there are wonderful bookend moments in this issue. The art by Segovia and Thibert suits the book nicely. There is a lot of kinetic energy in the action sequences. But the quiet scenes, the conversations between characters, look great with solid expressive work. 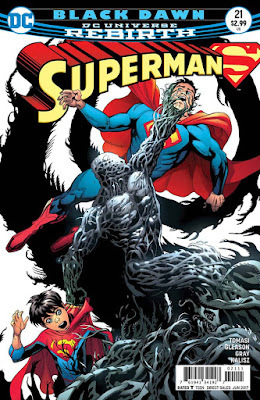 Superman #21 came out this week, continuing this arc looking at the World's Finest duo and their sons as well as exploring the mystery of the evil neighbor farmer Cobb. It is a very solid read by creators Peter Tomasi and Patrick Gleason, giving me a ton of stuff to mull over. The finest moments, as usual for this book, my favorite moment is one between Superman and Superboy, Clark giving some home-spun Pa-style wisdom. It is a shame there isn't much for Lois to do here but the bulk of the issue is a battle with a giant squid. But there is more here. We get a ton of back information about Cobb, more clues to his mystery. I thought for sure he was going to be all about magic given the weird Deadman Swamp issue. But now, it looks like there is a lot of mad scientist in Cobb. I am trying to put together all the clues but right now I am a bit stumped. There is certainly some major 'Watchmen' vibes but I keep hoping that stuff stays at the periphery. And we learn something about Kathy that made a wacky Anj theory spring into my mind. I thought Kathy was oblivious of her Grandpa's machinations. But now she looks like she smack dab in it. Gleason's art works very well this issue. The kaiju that shows up and the infantry of the enemy are well done. And the quiet family moments all shine brightly. I have to add that John Kalisz and Hi-Fi bring a bright palette to the proceedings. From a color perspective, this book really sparkles. The July solicits for DC comics came out this week and I have to say, there were a couple of non-Super surprises there which means I might have to moonlight a little to get ready for the summer spending spree. A trade is coming out for the first year of Brian Q. Miller's Steph Brown Batgirl book, a series I ate up like an eclair. And Dolphin is guest starring in Aquaman! And those aren't even my favorite surprise! And, as seems to be the norm, the super-books continue to look like they are on the right track with solid arcs and great art. 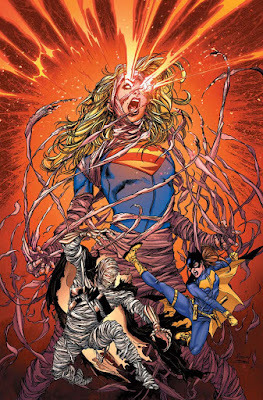 Love this cover with Supergirl ripping through the Phantom King-like bandages. I am really happy this is a prolonged Babs/Kara story arc, a way to cement their friendship in this continuity. And hoping that we get a great new understanding of the Phantom Zone. New Super-Man #10 was a very entertaining issue, stuffing a lot of story and plots into the short 20 page comic. I have been pretty impressed with writer Gene Luen Yang on this book before this issue. He has been able to really get me invested and interested in these new characters. But this issue gave us a lot to mull over. The main storyline of the Ox-Horse door rings and the portal to Hell comes to a satisfying close. But on top of that, we have more insight into Kenan's powers. We get a nudge in the plot of Dr. Omen and Kenan's father. And I Ching is at the center (or maybe centers) of some mysteries. 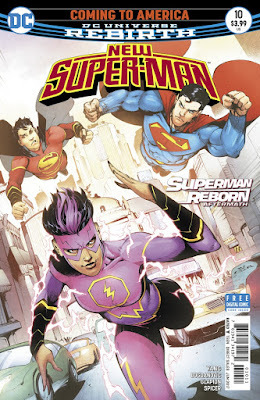 And, perhaps best of all, it is linked to the Superman Reborn arc. Superman is there and extends a hand to the New Super-Man, a sort of welcoming into the Super-Family. That makes me happy. The art is done by Viktor Bogdanovic and continues to have compelling visuals. Bogdanovic recently announced he's moving to Superman so this was a sort of teaser. But for me, this issue with hellish domains and giant guardians really sparkled. Add to that all the usual cultural references of China and you have a very fresh feeling book. A side project I am working on has recently had me thumbing through long boxes and looking at a diverse group of back issues. That search included All-Star Squadron back issues. Is was surprised to see the Crisis satellite scene show up in #53 and #54. I didn't recall them being there when I did my review last year and felt I should cover them here for completion sake. 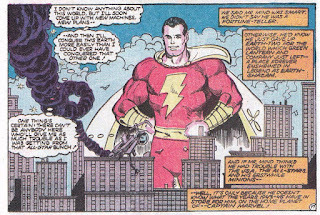 Both issues list Roy and Dann Thomas as writers and Mike Clark, Arvell Jones, Tony DeZunuga and Vince Colletta on art. The Crisis completely eliminated Earth 2 and changed the early DC history. I don't envy Roy Thomas for being given the job of rewriting and streamlining that part of continuity. 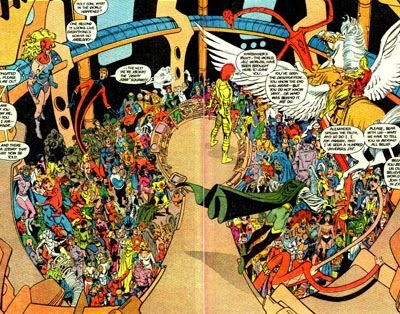 I get the sense that Thomas knew this was something of a last hurrah as we see panels dedicated to the earliest incarnations of heroes including the yellow gloved Earth 2 Aquaman as well as notions about to be obsolete like Earth-S.
DC certainly gave Thomas all the space he needed to wrap it up. 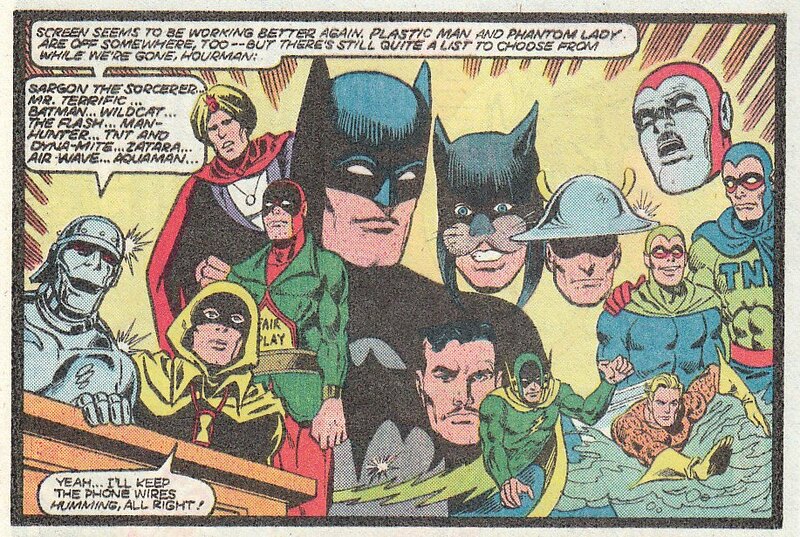 All-Star Squadron got 7 Crisis crossovers! Infinity Inc. got 8 crossovers! But let;s get to that satellite scene! 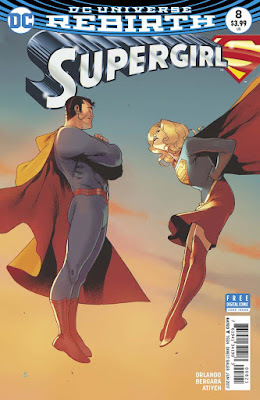 Last week, I gushed ... maybe too much ... about how great Supergirl #8 was. Settle in. 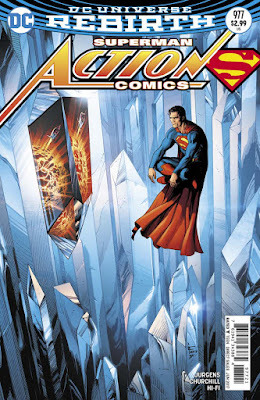 I am about to gush about Action Comics #977. I have been waiting for Superman to be back track in DC continuity. 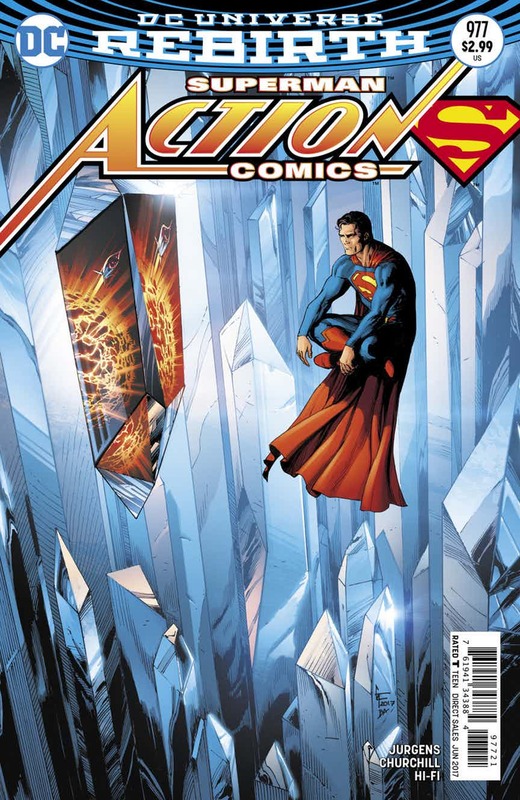 Yes, I loved Morrison's Action Comics run. Yes, I loved the early Pak/Kuder run in Action Comics. But otherwise, the years since the New 52 have been sort of a drag for Superman fans. It all seemed to reach a terrible critical mass of "Who is this character" in The Truth, when Superman was depowered, out of Metropolis, angry at Lois, riding a motorcycle, and kidnapping and pulverizing super-villains until they obeyed him. That isn't Superman. Which is why I have been thrilled about #Rebirth, a movement which was based on bringing back classic interpretations of characters. The theme has been to move away from deconstruction of these characters and instead to focus on construction instead. Ollie is a socially relevant crusader. Wonder Woman is an ambassador of peace. Supergirl is a young hero on the journey. And Superman is with Lois, a reporter at the Daily Planet, and an inspiration. That doesn't mean there aren't speedbumps. #Rebirth led to Superman Reborn which made two Superman timelines into one. But the pre-Flashpoint and the New 52 Kal's walked very different paths. The differences need to be reconciled. And while that can be done on a reader-to-reader basis (me figuring out what I want in and out), Action Comics #977 is a sort of primer. It sets the foundation of Superman's origin and beginnings. And that is a good place to start. Writer Dan Jurgens and artist Ian Churchill do a wonderful job setting the stage, acknowledging the stories from the past, and moving us forward. And we get the beginning of a new villain as well. I loved this book. And frankly, it was needed. I think the next time someone asks me that I am going to shove Supergirl #8 into their hands. 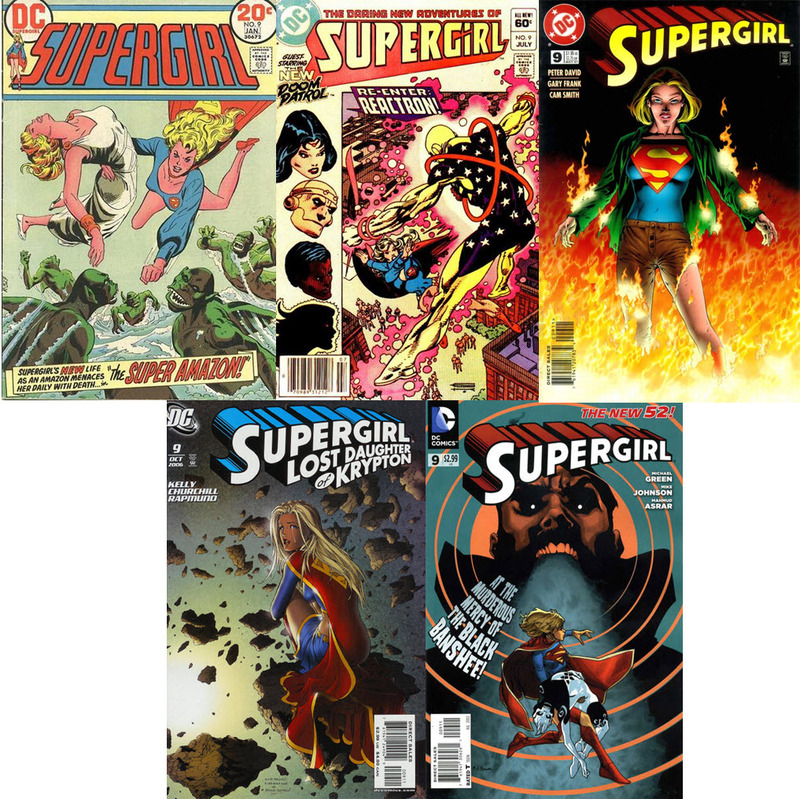 For Supergirl fans, the last dozen years have been an up and down affair. Kara Zor-El was back from being erased from continuity. But she was immature and angsty. But then Sterling Gates and Jamal Igle came along and she was a hero again, a part of the super-family. Then the New 52 happened and we took a step back. She was angry and angsty now. She hated the Earth and shunned her cousin. But then Tony Bedard, K. Perkins, and Mike Johnson came back and suddenly she was a likeable young hero again. Alas, nothing gold can stay and the book was canceled. Then the show hit the airwaves and Kara was in SuperheroGirls and DC realized she should have a book. And we got one with a young, eager hero who embraced her new home and was on a journey. And all seemed well again. Except one thing ... where was Superman in all this? Trust me, long time Supergirl fans know the big role Superman has played in Supergirl's life. In the Silver Age, he was like a shadow of doom, willing to hide her away and always ready to exile her from the Earth. But in later years, the two had a very good relationship ... as mentor and student or eventually super-partners. Since the New 52, most Supergirl fans have been waiting for the two to get back to that sort of loving familial relationship. These two are the last survivors of their world and families. They should want to be part of each other's lives. They shouldn't be angrily avoiding each other. But storylines made it impossible. When Kara was heroic, Superman was Grounded, or powerless and angry, or aloof. Thankfully writer Steve Orlando fixes all that baggage in one fell swoop. With Superman Reborn behind us, it is time to rewrite history a little and smooth over the rough patches. And so we get Supergirl #8, a book where the cousins hang out together, as family, and love it. But moreover, this isn't a Superman trying to guide Kara. It is a Kal appreciative and proud of all Supergirl has accomplished. She is an ally he will need to rely on. And Kara isn't put off by this. She is thrilled to have dinner, meet Jon, and play with her older cousin. The art is by Matias Bergara. His style is very reminiscent of Brian Ching's so the book's overall feel remains intact. And some of his expressions and quiet scenes are done in a very charming way. I can only show the highlights here but I honestly wanted to scan every page. On to the book. 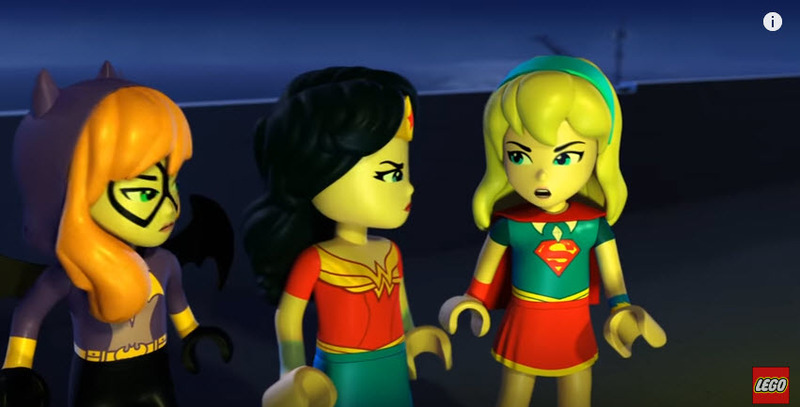 I knew that DC Superhero Girls had become a Lego property. And any sort of cross-pollination of these characters into different arenas is appreciated. Heck, think of how much the Lego Batman video games and movies have done to bring DC characters into people's homes. What I didn't know was that there are Lego DC Superhero Girls videos being produced and available on YouTube. There are a few to watch, most including Supergirl, and they all are a ton of fun. I know I am not the target audience but they are fun. If you enjoy DCSHG or the Lego movies, you probably will get a kick out of these. The spring New England Super Megafest is the unofficial start of my con season. The event is more about celebrities and pop culture than it is about comics. There usually aren't a lot of creators to get sigs from. And commission wants are even rarer. As a result, it is usually a nice, easy-going day to seek out the few folks I want to see, thumb through some comic boxes, and generally have a non-stress convention experience. This year was a little different in that the big draw for me was a celebrity. Laura Vandervoort was appearing! Folks hopefully know what a fan I am of hers. She played a strong, proactive, less moping Kryptonian on Smallville, often outshining her more famous cousin. I liked her on V. I thought Elena was a great protagonist on Bitten. And, of course, she was Indigo on last season's Supergirl. Seriously. How could I not go meet Supergirl? I got there early enough that I was the first at her table and got to talk a little bit about Smallville and Bitten. She seemed to agree that Kara having total mastery of her powers made her detract from Kal and so she needed to be sent away. Just think of all they did - amnesia, sent away, and ultimately cast into the future so 'Clark could fulfill his destiny'. I also talked just for a bit about Bitten. 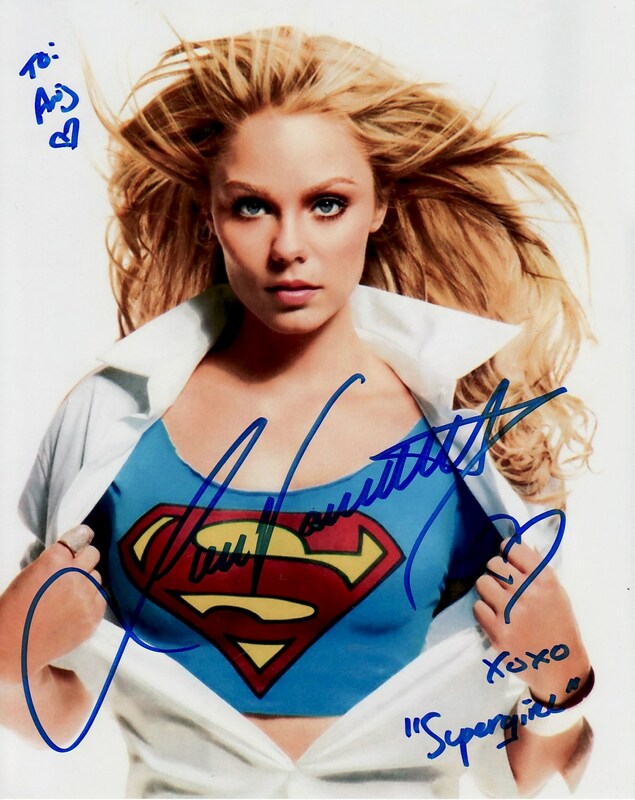 With no big comic creators to spend my money on, I opted to get a second autograph, this time on Smallville Season 11 #14, a book which spotlighted Kara on the cover. She liked the cover and flipped through the book which was pretty cool too. I don't often get star-struck but I am pretty sure that my brother who witnessed the interaction would say I was a little bit nervous. Weird. I guess you can take the boy out of the old man, but you can't take the fanboy. 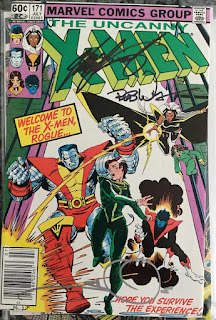 Anyways, I also got some comic signatures from Bob Wiacek. 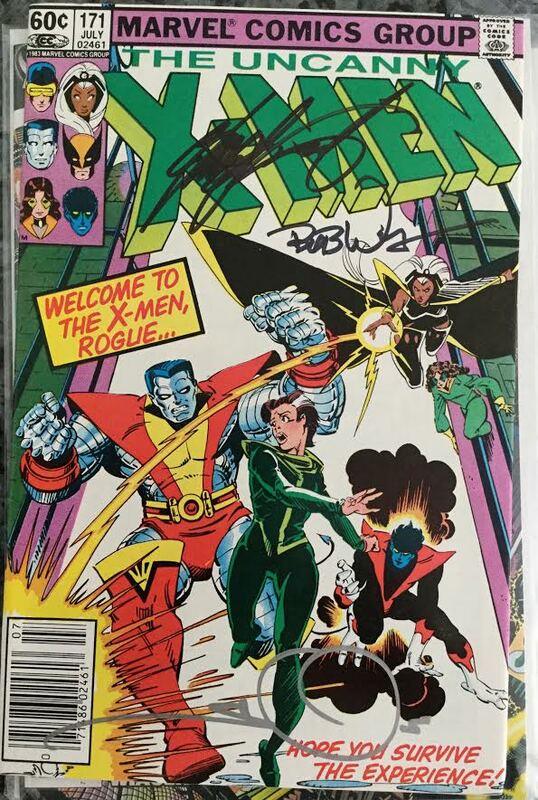 That means my Uncanny Xmen #171 now has sigs from the main trifecta - Claremont, Simonson, and Wiacek! Now the big question ... Terrificon or Boston Comic Con or both? So the other day I was on the DC Comics main website, mostly to check on what books were coming out the following week. While perusing, I noticed they have 'character' pages available, sort of an electronic Who's Who to give a thumbnail history of a character. I found it a little interesting that the one picture they have of her has her in the Michael Turner costume from 2004. That is two costumes ago, maybe three if you consider the changes that Jamal Igle made to it back in the day. 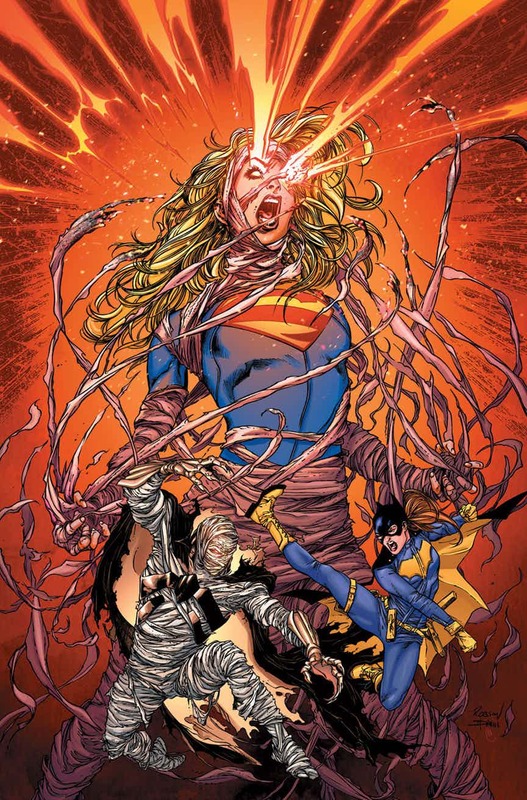 But I figured that the Turner picture is somewhat iconic for Kara Zor-El's return to the DCU so maybe I could understand. 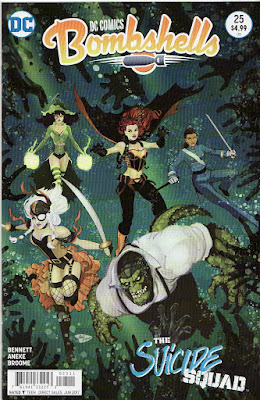 DC Comics Bombshells #25 came out this week, the print version of the digital first book. As always, this means I am behind the times. When this book first started, I was completely engaged. We were introduced to the characters. Writer Marguerite Bennett was writing the main characters' arcs in the style of movie genres. And it all came together eventually in a battle over London. After that, perhaps because it wasn't meant to go on, the book seemed to wander a bit. For me, the lack of Diana and Kara in the book was maddening. Well, this issue reminded me of those early issues. I felt something for these characters, for the first time in a while. There were two moments that hit me nicely as a reader. And I definitely like the addition of Rose Wilson and June Moone. Ravager and Enchantress are definitely two of my favorites. The art is by Aneke. This is the first I have seen of this artist and their style fits the book. I won't go in depth here. But I felt I should hit on the high points. 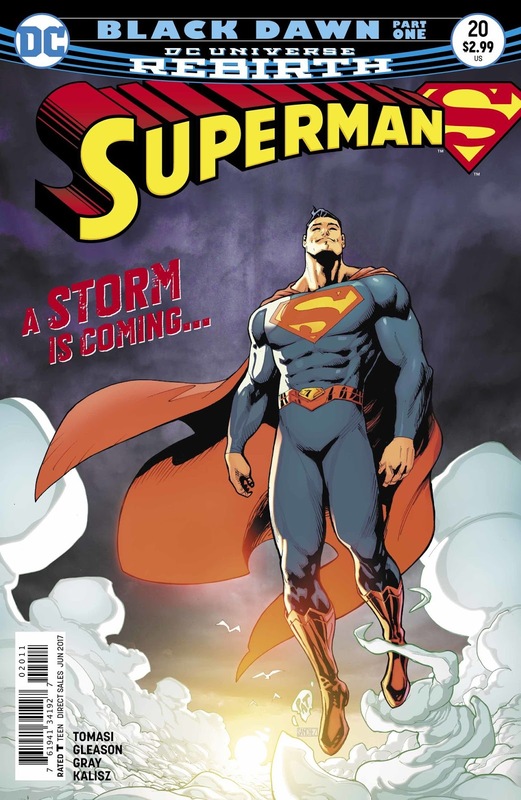 Superman #20 came out this week, the first issue since the Superman Reborn storyline which fused the pre-Flashpoint Superman with the New 52 Superman. How delightful for me as a comic reviewer to say Clark or Lois or Superman and not have to explain exactly which one I am talking about! How exciting for a continuity that everything is now linear and we aren't talking about Convergence worlds, the 21st century equivalent of a Pocket Universe. But while we are now dealing with one Lois and one Clark, we were dealing with two very different lives. Things aren't going to be entirely smooth. We as readers have to reconcile the differences and in our minds settle this whole thing into one history. And thankfully, writers Patrick Gleason and Peter Tomasi realize that the characters have to do that as well. This shouldn't be easy. They have to figure out who they are just as much as we have to. I think it would have been wrong to just move forward without some acknowledgment from Lois and Clark that their life is comprised of two lives shuffled together. This also is the beginning of a storyline called Black Dawn which finally explores the nefarious Farmer Cobb and his haunting milk business. Add in Batman and Robin, and you have a very satisfying first issue of this new reality. The Superman books are really clicking right now. I am very happy. On to the book! 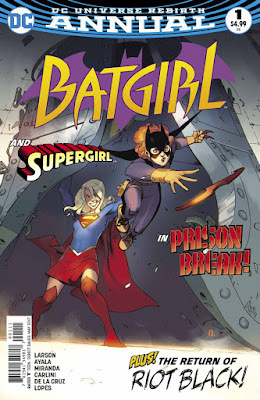 Earlier this week I reviewed Batgirl Annual #1, the first true meeting of the New 52/Rebirth incarnations of these characters. It was a fast friendship and a true 'World's Finest', right down to the title of the story. 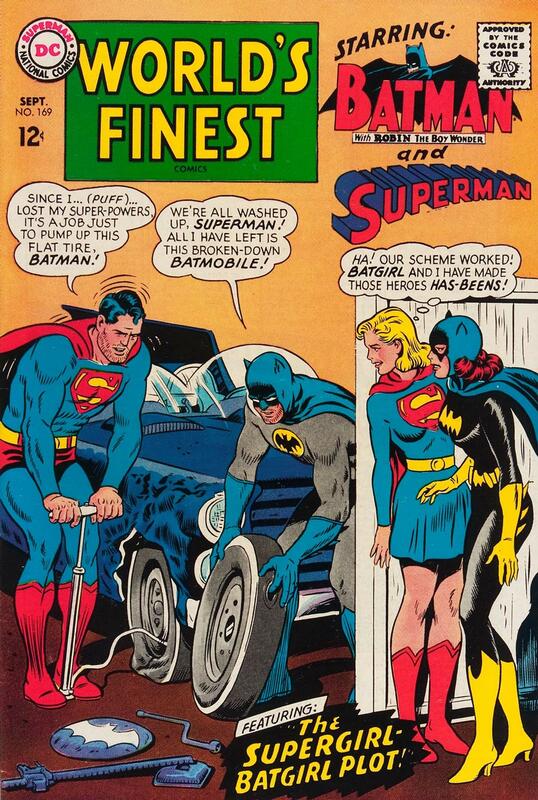 With that in mind, I thought I would head into the long box to review one of the older Supergirl/Batgirl team-ups and what better book to review than World's Finest #169. There is actually another decent reason to review this issue which will be obvious at the end. 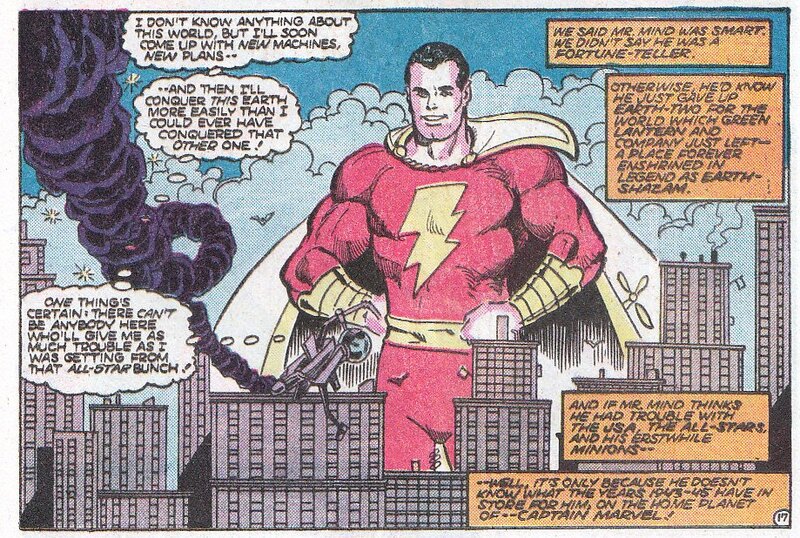 But the primary reason is to look at the Dominoed Daredoll and the Maid of Might teaming up. I will say up front this is an incredibly bizarre story. 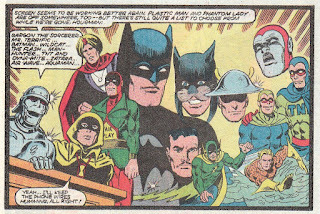 It could be a primer on the Silver Age and just how wacky that time in DC Comics was. So settle in for a bumpy ride with many twists and turns. I'll also remind folks that while there was always a sense that the pre-Crisis Supergirl and Batgirl were close friends (perhaps cemented by their scene in Crisis on Infinite Earths #4), there weren't that many stories with them partnering with each other. Over the years, I have reviewed a bunch of them for those who want to browse. My hope in this new universe is that we will see these two as friends in stories and crossovers. Maybe an annual event? On to the book. Hope every one is ready for the zaniness. I always wonder just how networks decide when they are going to take a break between episodes. Like why is Supergirl taking a 3 week break now? Last episode was one of the best and momentum is gathering. So why hit the brake? I would have taken the break after the episode before, when Kara broke up with Mon-El. Take three weeks off then and you might give the vibe that the break-up was longer than a mere 23.5 hours. I know, you would need to coordinate with the Flash musical episode. But this seemed like an odd choice. It is a doozy of a preview and you better have your finger on the pause button because there are a lot of quick cuts. 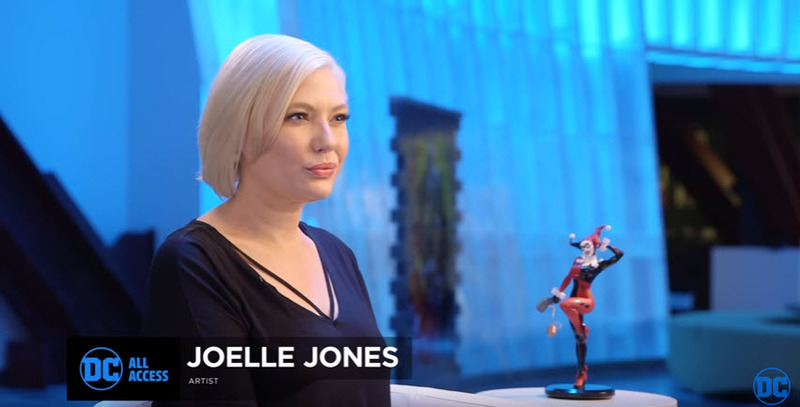 Over the weekend, news came out that artist extraordinaire Joelle Jones will be designing a series of DC Cover Girls statues. I am a big fan of Jones so this was great news for me. It looks like the first statue is going to be a classic Harley Quinn and it perfectly captures her zany, madcap fun. And I was glad to hear that Supergirl is going to be one of the statues in the line. Jones is already linked to Kara with the Supergirl Being Super book. But I since I love Jones' style, I am glad we are getting this. And, thankfully, there are early process pics of what the statue could look like over on Comics Beat. "Together again for the first time!" It's a tag line I love in comics. Between universal rewrites, reboots, and new people using classic superhero monikers, I have seen it plenty during my comic reading years. And it could apply to Batgirl Annual #1. 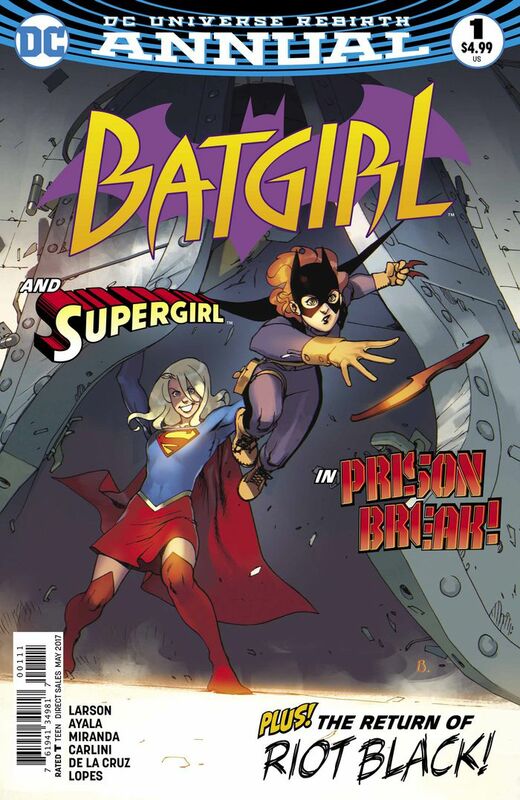 Because this is the first team-up between the New 52/Rebirth Supergirl and Batgirl. It seems almost a little odd that here we are 6 years out from the New 52 and this is the first time these two characters are talking to each other. And thankfully, writer Hope Larson makes them fast and easy friends. Enough of New 52 angst and isolationism! These two should be friends! It is even better that this story is a sort of secret mission, something that neither Bruce or Kal involved. This is something they want to do together on their own. It is clearly the beginning of a beautiful friendship and a multi-issue arc (we know this from solicits). And that makes me truly happy. I don't read Batgirl but the book jibes with Supergirl nicely, name dropping the DEO and even adding an evil Cadmus into the mix. The art is done by Inaki Miranda and the style has a vibe similar to what Joelle Jones is doing on Supergirl Being Super. There are some nice page layouts as well which accentuate the action as well. This is a definite read for fans of the Rebirth Supergirl!